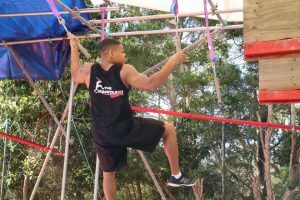 The 30th of July marked the date for the fifth round of The Compound Training’s monthly Ninja Warrior competition event. 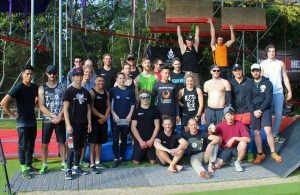 This month continued the head-to-head Team Ninja Warrior-esque course which motivates competitors to attack the course as fast as possible which lead to some really impressive runs with many lead changes, shocking falls and amazing saves throughout the day. 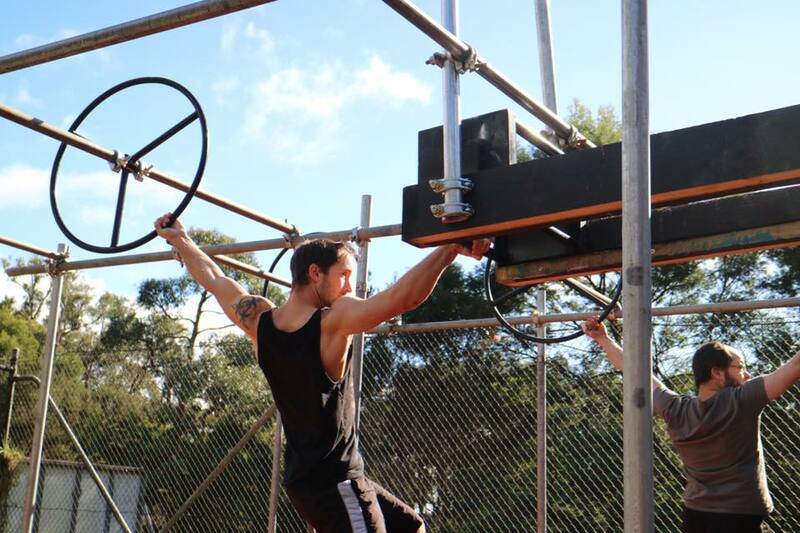 This month was also the first to be sponsored by Dave Garvin of Ninja Warrior Training Oz who provided a lot of the holds for the course and vouchers for the top 2 males and females. 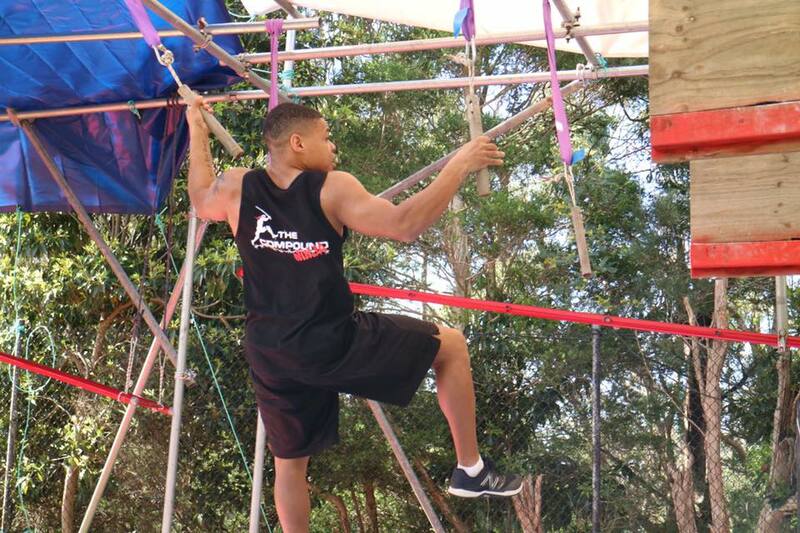 My day started out with the 2 hour drive to The Compound, with a small change this time by picking up Australian Ninja Warrior Semi-finalist Kadeem Aarons on the way. This made the drive fly by as we talked all things ninja and our plans and strategies for the course that day. Upon arriving at The Compound, this was one of the biggest turn-outs of any of the monthly competitions they had run, with some seriously note-able inclusions from interstate ninjas as well as some incredibly brave first time ninja’s competing in what must be a terrifying setting. 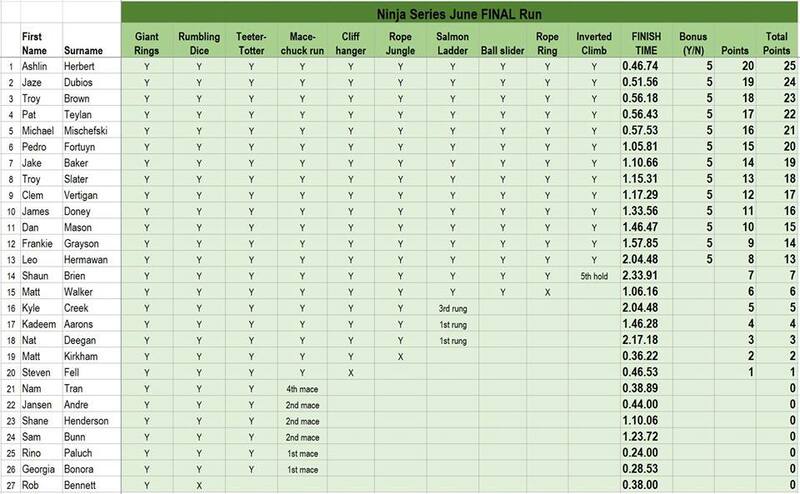 I decided to stick to my usual Ninja competition goals, firstly – don’t come last, and secondly – finish the course. More on how I went with those later though. Salmon ladder (up 3 rungs). The rules in qualifying were that you could fall off of any obstacle, but if you did you would have to return to the start of that obstacle and do it again. This changed in the finals where you could only fall off the teeter-totter and bouldering wall 3 times each and on anything else, the floor was lava. An additional rule was also added to the teeter-totter, that you could climb under it rather than walk over it, however you would receive a 25 second penalty to your time. A nice change compared to last month was that I was not in the first qualifying heat, I had seven heats to watch before I needed to be ready so I spent this time taking photos of the competitors and trying to get an idea of the best technique for each obstacle. My heat was against Matt Walker from Sydney and he is the real deal. For a brief moment in the heat I was ahead of him from the spinning wheels to the rumbling dice, but on the lache of the dice I was incredibly lazy with my back leg and it landed behind the landing platform and I needed to reset. I need to add here that I had practice on this course more times than any other course before and I had never failed this obstacle. It just goes to show that you need to have your head dialed in for competition. On my second attempt I really made sure of the lache and then flew over the teeter-totter which had severely bruised my privates just one week earlier, the next part of the course was my personal favourite and I managed to get through it relatively quickly. 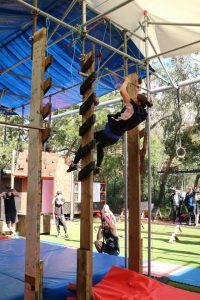 Next up was rope jungle, I’m relatively tall and have a good wingspan, so this had always been easy in the practice runs, my method was to swing from the first rope, skip the middle rope and use the last rope to get enough momentum to land on the platform. In this heat, what that translated to was swing from the first rope, grab the third rope, kill my momentum and then have to build up a swing to dismount. 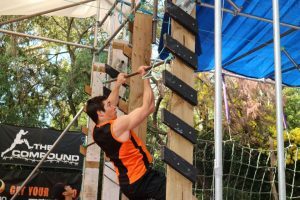 Next up was the Salmon ladder, (oh by the way, at this point Matt Walker had finished a good 17 minutes ago with the 2nd fastest qualifying time) I had practiced the salmon ladder a lot this month, as it’s what got me last competition. I had focused on making it to the top while gassed and really dialing in the technique so it felt automatic. I then proceeded to fail the ladder 3 times and then my run was over. A pretty disappointing qualifying run, but I knew it could only improve from there. A great thing about the large amount of competitors this month was the extra rest time between the heats and finals, it really gave me a chance to focus and get my composure back before my final. My final put me up against Kyle Creek and clearly my mental prep had worked because this was one of the best runs I’ve ever had. This run was neck and neck through the spinning wheels and rumbling dice, I took a slight lead over the teeter-totter and into the mace-nunchuck alley and over the cliffhanger. 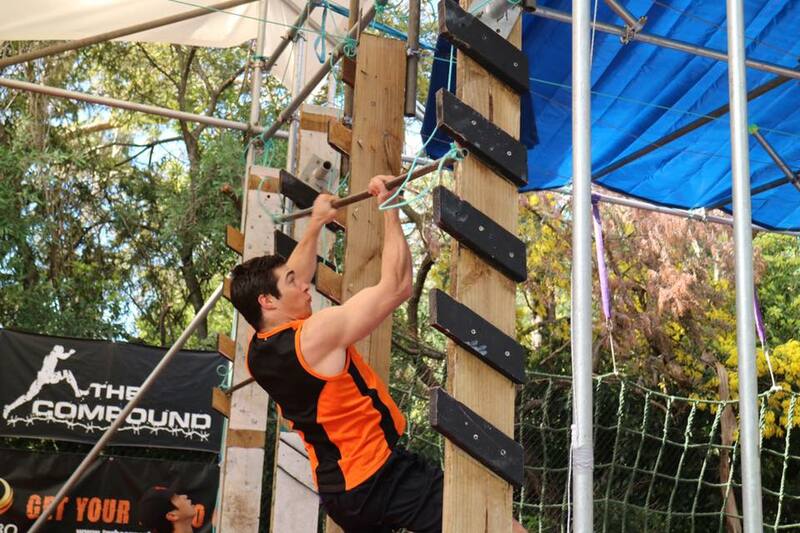 Kyle took a shorter rest before rope jungle and took the lead back, before disaster struck his run, his arms no longer wanted to cooperate on the salmon ladder. I was completely oblivious to this 1 meter to his left and went up all 3 rungs of the salmon ladder in less than 10 seconds (a personal best by far) flew down the ball slider, accidentally dropped an f-bomb when I thought I was going to miss the pipe and then made the grab, then swung my way to the bouldering walls landing platform. It took me 90 seconds to get to this point, slow in comparison to the elite ninjas at The Compound but for me that was lightning fast. For the next minute I got to experience first hand the realisation that I really need to practice bouldering so I can get my body positions right and finish any course which has it in future. There were some incredible highlights in the finals of this competition (most of them are highlighted in the video at the end of this post), but I would just like to point out some honorable mentions. Jaze Dubois making it up 3 rungs in one move on the Salmon Ladder in his finals run. Leo Hermawan pulling a forward roll on dismount to avoid falling back off the mat. Matthew Kirkham almost making an amazing save inches off the ground in rope jungle. 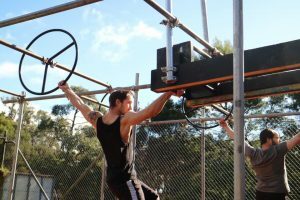 Clem Vertigan in qualifying making it to the top of the Salmon Ladder 3 separate times after missing the landing mat. Georgia Bonora and Nat Deegan being able to get through the Mace-Nunchuck run despite the first mace being an insane leap for them. Dan Mason the barefoot ninja competing with a broken fibula and still coming 11th on one leg. Ashlin Herbert (Australia’s fastest tradie) being so fast that I couldn’t get any good footage of his run. 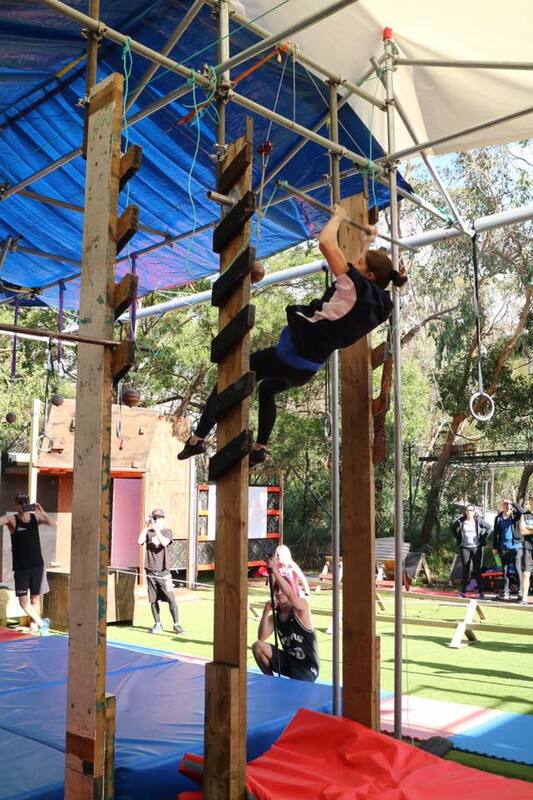 All in all it was another epic competition at The Compound and I can’t wait to see what Clem has in store next month when the course returns back to a more traditional individual vs the course Ninja Warrior style. Another good write up. It was an awesome day with loads amazing efforts. Georgia finishing the course in the heats. Jaze triple rung salmon ladder was insane. Ash wearing a 20kg weight vest (matching my weight) and still beating me up the salmon ladder. Worst part about that is I would of been more suprised if he hadn’t beaten me. Pat’s insnane turbo charged speed through the mace and cliff hanger. ← AusNW Season 1 Episode 9 recap! → AusNW doubles prize money for Season 2!